This article discusses correction of the QT interval for rate. I've been working on this a long time, thought about submitting it to a journal, but decided it gets more readers on this blog. Specifically, we discuss the use of the "Half the QT" Rule of Thumb, a visual estimation method which declares the QT to be prolonged if the QT extends more than half the RR interval. We compare this method with the four most common QT correction formulas. This is a detailed post, with interesting graphics produced and conceived by Ari B.Friedman, MD, Ph.D., now an EM resident at Beth Israel. The article is written by Dr. Smith and Dr. Friedman. Daniel Lee (HCMC 1st year resident) also did a bit of valuable editing. Figures were produced by Dr. Friedman. The QTc rule of thumb is this: If the QT interval is less than half the RR interval, then the corrected QT (QTc) is not prolonged. We compare this rule to the 4 common formulas for correcting the QT. However, none of the formulas have proven to be definitively better than another and none are well correlated with outcomes or events! 1) At heart rates between 62 and 66 bpm, the rule of thumb is accurate. This makes sense, as at a heart rate of 60, the corrected QT is the same as the raw QT: a prolonged QT is around 500 ms, and at a rate of 60 bpm, the RR interval is 1000 ms (1 second). 2) At heart rates above 66 beats a minute, the rule of thumb is conservative; it overestimates the QT. In other words, if the QT is less than 1/2 the RR (QT non-prolonged) and the heart rate is above about 60 beats a minute, you can confidently say the QT is not prolonged. 3) At heart rates below 60, far more caution is due. The rule of thumb is less accurate, and the risk is higher because a long QT in the presence of bradycardia ("pause dependent" Torsades) predisposes to Torsades. 4) Computer algorithms are not accurate at QT measurement, especially if prolonged. Do not trust the computer if the QT looks at all prolonged. Measure it manually. 5) The "Half the QT" rule of thumb correction is linear: the QT is considered long if it is greater than 0.50 x the RR interval, a linear relationship. The QTc by this method = the raw QT divided by the RR interval and is long if the result is greater than 500 ms.
6) Use a different rule of thumb for bradycardia: Manually approximate both the QT and the RR interval. If the QT interval is less than 40% of the RR interval at 40 bpm, then it is not prolonged. If the QT is longer than 40% of the RR, then do a formal measurement and correction. 7) This last point may be generalized to all correction methods: it may be hazardous to correct the QT when the heart rate is below 60. Use correction primarily for heart rates above 60! It is not easy to discern the end of the T-wave, as it is distorted by the P-wave. But the QT is definitely greater than half the RR interval. However, Bazett is known to produce falsely prolonged corrected QT at high heart rates. So is it really prolonged? How do we know? Answer: you must treat the patient's underlying condition causing sinus tachycardia, and repeat the ECG at the lower heart rate. AHA/ACCF/HRS Recommendations for the Standardization and Interpretation of the Electrocardiogram, Part IV: The ST Segment, T and U Waves, and the QT Interval (full text link). 2. The longest QT of the 12 leads should be used. It is usually V2 or V3. 3. Do not measure the QT in any lead that is obscured, especially by a U-wave. Leads aVR and aVL are least likely to manifest U-waves. 4. It is essential to visually validate QT intervals reported by the computer algorithm, as it is frequently incorrect, especially when prolonged. See this review of computer interpreted ECGs. 5. 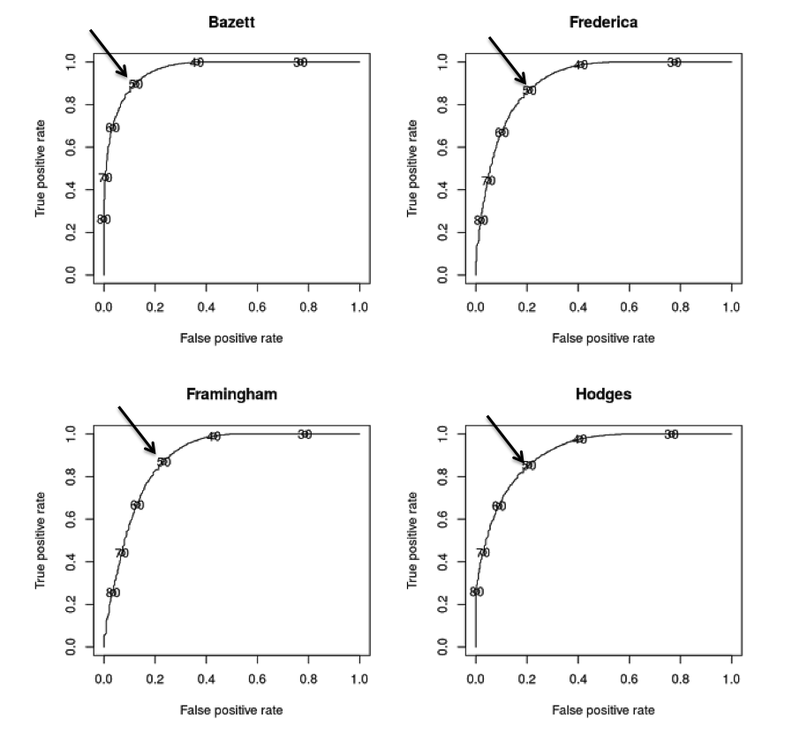 Bazett and Fridericia corrections may be substantially in error, especially at high heart rates. 8. Rate correction should not be used when RR interval has large variability, as in atrial fibrillation. 9. Prolonged QT is generally thought to be 450 ms for men, 460 ms for women. 10. Dangerously prolonged QT is 480, especially greater than 500 ms.
11. Abnormally short is less than 390 ms. They do not say which correction formula should be used when assessing these abnormally long or short QT intervals. In that article, they do not say what is a dangerously short QT is (e.g. short QT syndrome, SQTS). However, according to these diagnostic criteria (JACC 2011; 57(7):802), it is a Bazett corrected QT of less than 330-370, depending on other diagnostic criteria, including 1) h/o cardiac arrest, 2) sudden syncope, 3) family hx of sudden unexplained arrest at age less than 40, 4) family hx of SQTS. 2. Automated algorithms often have their own proprietary methods of correction which they will not reveal. 3. Modern digital ECG machines compute QT intervals using temporally aligned superimposed leads and choose the longest of the intervals, meaning the computed QT will be longer than all but one single lead measurement. 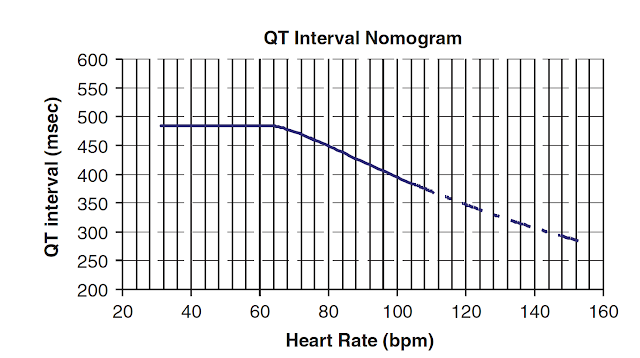 Values currently regarded as normal were established at a time when older machines measured QT intervals via individual leads, and these values likely do not correlate with modern computed QT intervals. If the combination of QT and Heart rate places your patient above the line, then the QT is prolonged. If the combination places the patient below the line, then it is not prolonged. 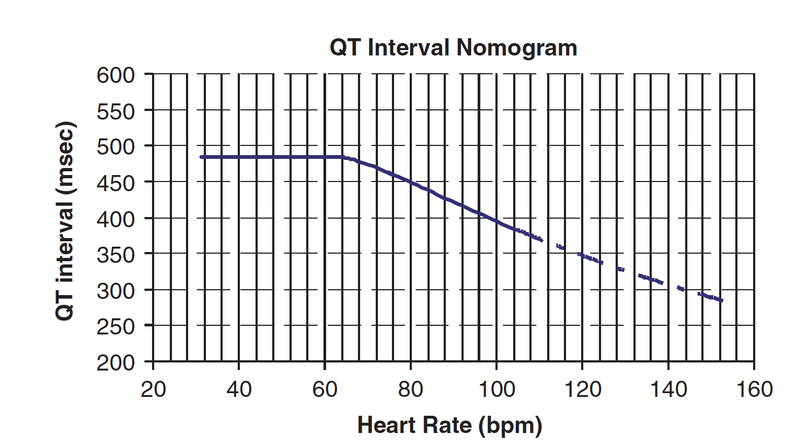 Notice this nomogram, at heart rates under 60, does not result in the QTc being shorter than the QT! This again points out the danger in correcting at slow heart rates! 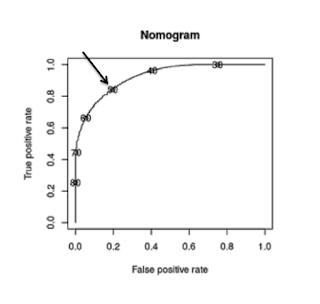 How well did the nomogram work in this derivation study? The sensitivity and specificity of the QT nomogram were 96.9% (95%CI 93.9–99.9) and 98.7% (95%CI 96.8–100), respectively. 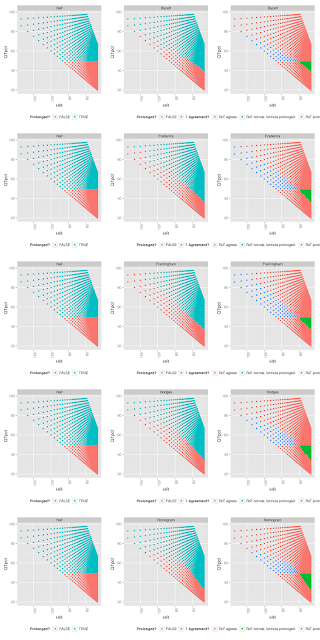 For Bazett QTc = 440 ms, sensitivity and specificity were 98.5% (95%CI 96.3–100) and 66.7% (95%CI 58.6–74.7), respectively, whereas for Bazett QTc =500 ms they were 93.8% (95%CI 89.6–98.0) and 97.2% (95%CI 94.3–100), respectively. With that background in mind, we can now turn to the commonly-used rule-of-thumb. The rule says that to estimate whether the QT is prolonged, one must only determine whether the QT interval occupies more than half the RR interval. But does the rule work, and under what circumstances should we worry that it gives us an estimate that is too short or too long? Ideally we would investigate by comparing the rule-of-thumb to a gold standard formula or nomogram that was carefully calibrated against a large database with mortality as the outcome. 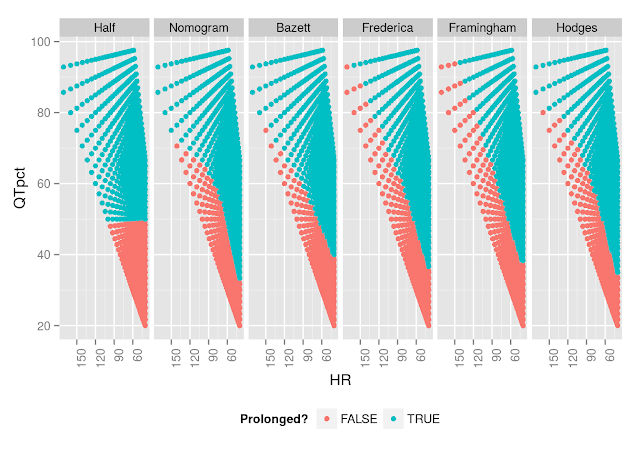 Although the existing rules were not derived with mortality outcomes, the Bazett correction was used to correlate long QTc with outcomes in the studies cited above. Instead, in this blog post we will compare the rule-of-thumb to each of the four formulas, effectively substituting usual care for the unattainable gold-standard of outcomes. To assess agreement between our rules, we examine QT intervals from 300 ms to 1000 ms, and RR intervals from 350 ms to 1500 ms. We are not using any human or patient data; we are only comparing the rule-of-thumb to various formulas, which may or may not be correspondingly validated by health data (the risk of sudden cardiac death, for instance). Figure 1. Here we can compare the different formulas, using a cutoff of 480 ms to determine when the QTc is prolonged. The formula named “Half” is the rule-of-thumb that the QT is prolonged if the QT interval extends more than half the RR interval. Already, we see divergence between the rules. One can see here that the rule-of-thumb indicates a prolonged QTc for any QT of 300 ms or longer if the RR interval is less than 0.6 (HR greater than 100). This contrasts with the formulas, which can have a QTc within normal limits in such cases. Importantly, compared with the formulas, at high heart rates (low RR), the half-the-RR rule of thumb tends to label too many QT’s as abnormal. 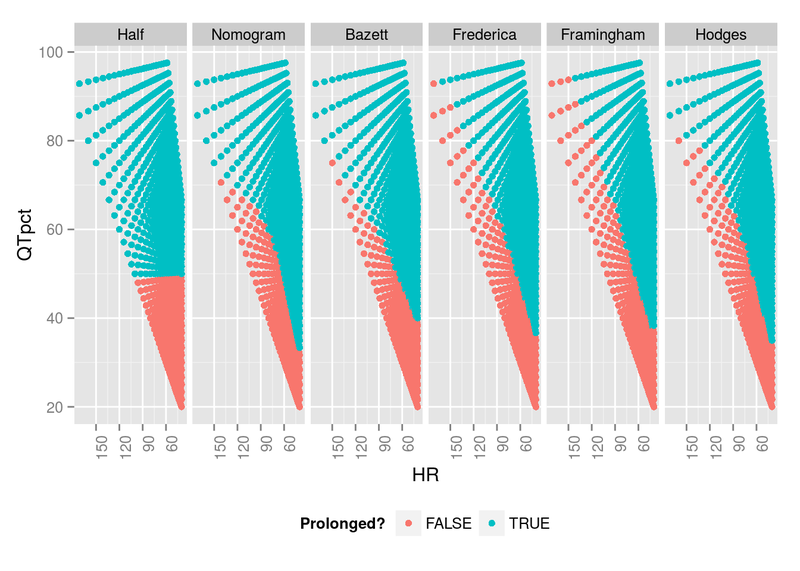 At low heart rates (high RR), the rule of thumb tends to label too many as normal. We can make the same graph, but with QT shown as a percentage of RR, and plotting either RR or HR on the x-axis. You can also see clearly that in all the other formulas: 1) There are many situations in which the QT is more than half the RR, yet the QTc is normal according to the formula. 2) Conversely, there are many situations in which the QT is less than half the RR, yet it is prolonged according to the formula. 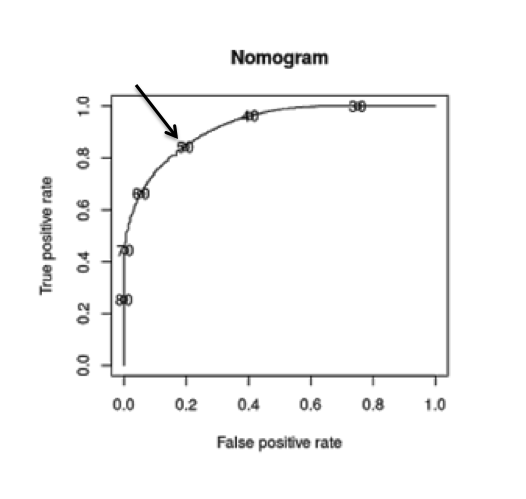 Putting the percentage on the Y axis demonstrates the impossibility of a perfect formula based on a percentage: if we move that horizontal line up (by increasing the % of the RR that is considered prolonged up from 50%), the test will be more sensitive for a prolonged QT (fewer false negatives) at the expense of more false positives (classifying more QT-RR pairs as prolonged when they are within normal limits according to the formulas). For normal heart rates, from 60-90, many QT intervals which are prolonged using the formulas are NOT prolonged by the rule of thumb. Without knowing health outcomes, it is impossible to accurately weight the misses vs. the over-calls; one cannot determine what the right cutoff should be. 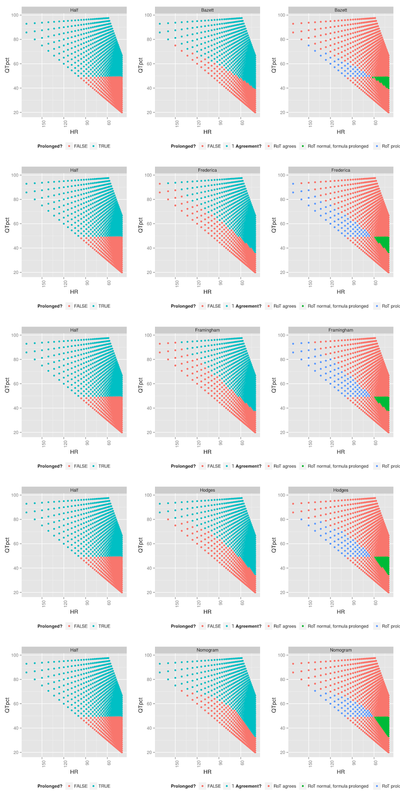 A receiver operating characteristic graph over all the different percentage cutoffs might help more formally make those tradeoffs. Also, note that it is possible to derive a formula that indicates when each formula disagrees with the rule-of-thumb, but doing it graphically is more informative, so that is the approach taken here. Figure 4. It does seem like there is an area where the rule-of-thumb seems particularly good. Where’s the transition point? 1. The left column shows where the rule-of-thumb is prolonged. 2. The middle column shows where each formula is prolonged. 3. 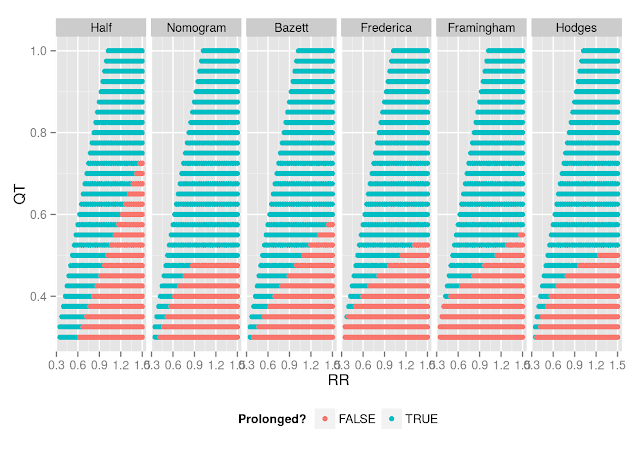 The right column shows the areas where they disagree. 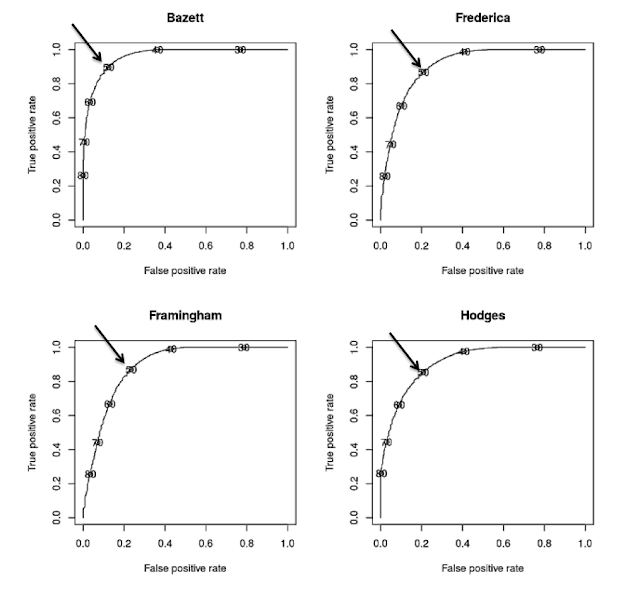 We will plot the four formulas, with HR on the X-axis, and QT in percent of RR terms on the Y-axis. Click on the image to see it full size. There’s a narrow band of heart rates in which it’s impossible to go wrong. Above or below that, agreement has its trouble spots. Below 62 bpm, the rule-of-thumb failed to note prolonged QT as indicated by all four formulas. This is in spite of the fact that a long QT is most dangerous in bradycardia. At a heart rate of 40 bpm or less, for instance, all 4 formulas all declare a QT lasting just 40% of the RR to be prolonged. By contrast, above 66 bpm, the rule-of-thumb was overly conservative. At 96 bpm, all four rules consider a QT stretching 60% of the RR interval to be normal. We might think about two reasons to be concerned with prolonged QT intervals in the ED. The first is to take appropriate measures to prevent the acute risk of progression to TdP; the second is to avoid discharging someone who could be identified as being at risk of sudden death. As a screening tool at normal heart rates, there is good agreement between the major formulas and the rule of thumb. Since the rule-of-thumb is conservative at higher heart rates, and the risk of TdP is also lower at higher heart rates, a lack of QTc prolongation by the rule-of-thumb should be reassuring. On the other hand, the rule-of-thumb in bradycardia is prone to false negatives and probably should not be used at these lower heart rates. Interestingly, Bazett's formula, which is the most commonly used in online calculators and in EKG machines, is the least conservative at these low heart rates (i.e., it is the most likely formula to show QTc less than 480 at low heart rates, in spite of its reputation for undercorrection). Thus, a borderline QTc in the context of bradycardia may be less re-assuring than with other formulas. Additionally, computer algorithms are not accurate (Heart 1996;76:422-426) at measuring the raw QT when it is prolonged, and the difficulties in its measurement are well outlined in the paper by Drew et al. Here is another study showing how insensitive computer algorithms are for a long QT (Pediatrics 2001;108:8 –12). When the QT appears to be long to the naked eye, it must be hand measured, regardless of what the computer measures. Another way to examine this issue is to approach it as though we had to choose our own percentage from scratch. Rather than starting with 50% (half the RR) as the rule-of-thumb, we will calculate agreement between the various rules and a whole spectrum of rules-of-thumb, each with a different cutoff. Note that these measures depend on the population values, and since we have arbitrarily generated a population of values, this analysis is inherently problematic. Still, absent data on how prevalent RR and QT pairs are in the ED, it’s hard to do better. Plotting the Receiver Operating Characteristic (ROC) curve compared to each formula as the gold standard, and labeling the cutoffs (i.e. 50 represents the half-the-QT rule-of-thumb), we see that half the QT was not an unreasonable choice compared to 40% or 60% of the QT. It performs particulary well when evaluated by the Bazett formula; unfortunately, by many measures (see literature above), the Bazett formula may be the least accurate in identifying QT risk. How about the corrected QT interval in bundle branch block? An article published by Dr. Ken Dodd and Dr. Stephen W. Smith published in the International Journal of Cardiology suggests that the T-peak-to-T-end (TpTe) interval is the best measure of a prolonged QT. They did not correct for rate in this article. It is likely that this applies to other intraventricular conduction delay and also to RBBB. An prolonged QT is longer than 85 ms - 100 ms in BBB. Our thanks to Drs. Stephen Smith and Ari Friedman for their impressive work sifting through the large amount of data regarding clinical use of the QT interval. As one who has used the QT Rule of Thumb for decades (including this approach in my QT chapters, since the first of my ECG books was published in the 1980s) — I wanted to add a few supportive comments. First, as emphasized in this post — judgment is essential for assessing the significance of the QTc in any given patient. Distinction between a QTc interval that is acceptable, vs one that is likely to be problematic is not dependent on any single specifically defined upper-limit numerical value, but rather is a function of a series of clinical and ECG features such as heart rate and rate variation; serial QTc measurements; ongoing QTc-affecting medication use; and other clinical factors that may influence the relative likelihood of the patient in question developing Torsades de Pointes. Optimal use of the “QTc Rule of Thumb” recognizes the imperfection of this method, and therefore seeks simply to classify the QTc interval into one of 3 general groupings: i) “Normal” QTc; ii) a “Prolonged” QTc; or iii) a “Borderline” QTc. Rather than stating that “if the QTc is less than half the R-R interval, it is not prolonged” — optimal wording of this Rule of Thumb is, “that for the QTc to be prolonged, it must clearly be MORE than half the R-R interval”. 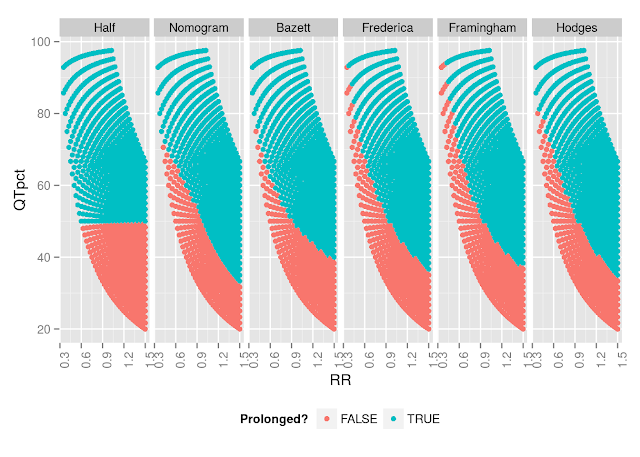 If the QTc is half the R-R — it may be borderline. Caution is essential in using the Rule of Thumb for “faster heart rates” (ie, once heart rate exceeds 90-100/minute). The Rule of Thumb should clearly not be used for cases such as the 1st ECG shown in this post, in which the heart rate is ~150/minute (and the Rule should probably not be used once heart rate exceeds 120/minute). And, as emphasized in this post — providers should recognize the difficulty inherent in estimating what constitutes a problematic QTc with marked bradycardia. With these caveats in mind — the Rule of Thumb works great! It allows me to teach a group of providers how to quickly and accurately recognize into which of the 3 general groupings a given patient falls most of the time. As emphasized in this post — when more accurate determination of a specific QTc value is clinically important to the case at hand — then the provider needs to more accurately verify the QTc value obtained. Email me at: smith253@umn.edu and let's discuss it. OK? Given the potential inaccuracies of the computer-measured QTc, should that change our thinking when using the calculated QTc for the LAD occlusion vs early repol calculation? Should we be hand measuring the QTc to ensure a more accurate calculation? or is it appropriate to just eyeball the QTc and only hand measure it if it seems off?? You can generally trust the QT when it is in the range found in such cases: 370-440. It is when the QT is long that the computer falsely measures it as shorter than it is. Sounds good, thanks for clarifying that for me! it for the second time with ever more interest. 1000 ms) and, moreover, Bazett more so than Fridericia. Hence, QTc > QT. not shorten enough, that is QTc < QT, but not enough so. supposed to remove the QT dependence on RR. 2. are to be satisfied together. - From 3. it goes that QTc as a function of RR is a line. the raw QT value at RR=1000 ms.
the QT-RR plane for RR < 1000 ms.
curves on the QT-RR plane for RR > 1000 ms.
- Hence, the (perfect) QTc cannot be a line. it is not a line anymore. support in resolution of this dilemma in my head. problem. Looking forward in hearing from you. So this is cool and I applaud his enthusiasm. I think this is mainly a problem of wording and interpretation. "Over-correct" and "under-correct" don't mean it's u-shaped, they mean it's not brought enough towards the line. This is apparent from the diagram that he made. I think he's reading the words as implying that QTcF/B are u-shaped and that should not be the case. All those figures show exactly what happens when square root is used vs. simple inverse. Just study those figures!